The new issue, which is the third issue, of Ghost Ocean Magazine features an interview I did face-to-face with Marynia Kolak, a very kind and insightful reader from Roosevelt University‘s graduate writing program. You’ll know it’s live, rather than over email, by the many elipses and near-ramblings. The slide is a great novel. It’s wonderfully and uniquely descriptive on every page…The characters’ voices are perfect…Beachy is like one of DFW’s rebels from the TV article who is unafraid to get at the uncomfortable, vulnerable truth underneath the surface. I love this book, and I look forward to the next one. Flattered as hell and grateful as always. Happy new year, folks. Beachy has a distinct and very funny voice, and the book’s mood of confused longing sticks with you...It’s affecting and a little bit strange—and when I was done I vowed to read whatever Beachy writes next. Anyone looking for a juicy-as-hell story about why the Times hasn’t yet reviewed The Slide please contact me and I will be happy to make one up. Well hey thanks, Chicago Reader and people who read the Reader, voters, and personal friends. 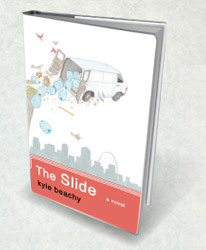 The Slide has been deemed this year’s Readers’ Choice for “Best Book By A Chicago Author In The Past Year“. The Reader’s Choice (very important apostrophe placement) is Aleksander Hemon’s The Lazarus Project.